Working from home can provide many benefits compared to working at an onsite job. Even though it has many benefits, working from home also requires discipline and focus to be successful. Following our working from home tips will help you to succeed. When you tell someone that you work from home, the primary image they usually have is that you sit around all day doing what you want while getting paid. Most people think it’s like working and being on vacation at the same time. That couldn’t be further from the truth. Working from home requires quite a bit of self control. One of the biggest obstacles when working at home is that your work life and home life seem to blend and run together. It’s very important to have discipline while working from home, to keep these two parts of your life separate. This is one of the most important best practices and working from home tips. It’s important to keep regular working hours / office hours so that you avoid working too few hours one day, and having to pull an all nighter the next to make up for lost time and to keep project deadlines. Try to get into a routine and work the same sort of schedule every day. Plan your family time before or after working hours. Also be sure to schedule in rest time and time for your hobbies. When working onsite, employers are required to give their employees regularly scheduled breaks. It’s important to take regular breaks at work, even when working from home. Use that time to take care of personal things or to just let your brain rest for a moment. Doing this at home can also help you to avoid getting burned out and will allow you to stay more focused when you are actually working. One of the biggest challenges with working from home is avoiding distractions. Avoiding distractions will automatically increase productivity. When working from home, it’s easy to get consumed by home tasks that also need to be done. It seems as if there are always errands that need to be ran, house chores that need to be done, and children that need homework help. Remember to work during work time and save all the other things for before or after work hours, unless it’s an unusual circumstance and absolutely necessary. It’s much easier to increase productivity if you set rules and keep your workday distractions to a minimum. When working from home, it’s very important to make a to do list to structure your daily tasks. As the last task for each work day, make a to do list for tasks that need working on the the following day. With a concrete list of business goals, you are more likely to stay focused on and complete your work tasks. Staying in pajamas all day is great, but it is not the best work habit. Pajamas are for night time and for sleeping. Not for working in. Invest some time in yourself. Take time to have a good nutritious breakfast, shower, and get dressed. When you look good, you will feel good. You also will be more productive too. Have a separate designated work space. Have a separate work space, even if it is just a desk in the corner of your dining room. Do not fill your work space with anything that is not work related. When you are in your work area just focus on work. Make your work space a place you enjoy and that makes you productive. Working from home is great and can solve many problems that may occur when working an onsite job, but it does require self discipline to make it work. Following our working from home tips, such as keep regular working hours / office hours, take regular breaks at work, increase productivity by keeping distractions to a minimum, make a to do list, get dressed like you’re going to work, and have a separate designated work space, will help you to stay focused, balanced, and successful. 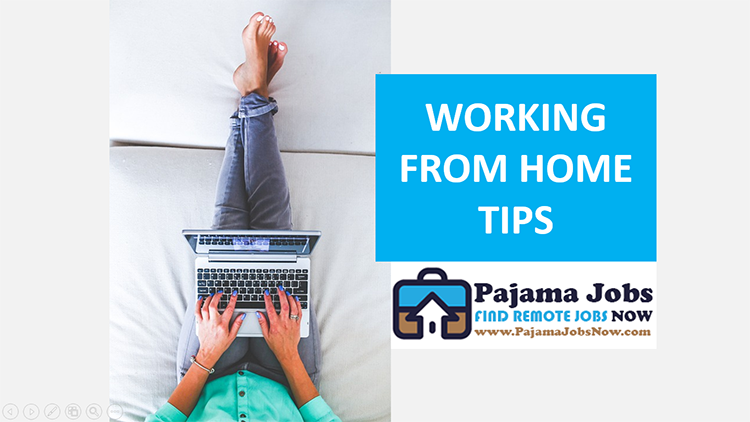 We hope you found our Working From Home Tips article beneficial to your work at home job search! Good luck and happy non-commuting! To see more work at home jobs like these, view our Remote Jobs page. To be the first to hear about great work at home opportunities, like our Facebook page. PLEASE SHARE this post! Be a pal. Help your friends that may be looking for remote jobs too.